On the 27th January 1925, Auburn South’s first Head Teacher, Mr William Hardy, was appointed, and began his duties at the School. On the 26th February, the Minister of Education, Sir Alexander Peacock, officially opened Auburn South Primary School. Most of the 253 pupils in the first year came from State School 888 Camberwell. The original two-storey brick building contained nine classrooms, an office and a staff room. The inaugural meeting of the first School Committee took place on 19th March, with Mr. W.T. Lewis being elected Chairman, Mr. C.R. Jones being elected Treasurer, and Mr. F.S. Thomas, Correspondent. 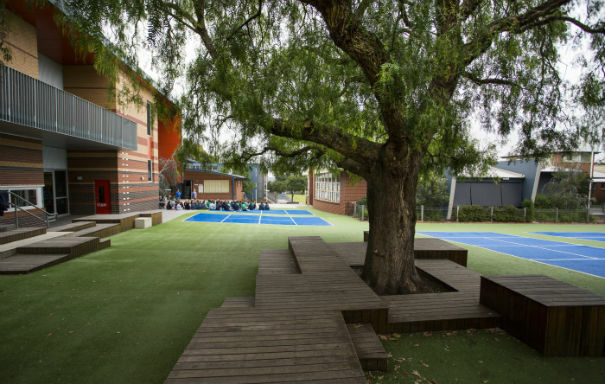 Over a number of years, Auburn South Primary School has built a strong reputation for its high levels of student achievement and its innovative programs; particularly the adoption of the International Baccalaureate Primary Years Program (IB-PYP) in 2004. This program uses an inquiry learning approach and through it the school has sought to extend the capacity of its students to access advanced curriculum content and to provide a learning environment which motivates the students to think, create and explore. The school’s enrolment numbers have risen steadily over the past five years and currently caters for a student population of 655 students (2018). The integrated use of Information Communication Technologies (ICT) is, increasingly, a feature with the introduction in 2011 of a 1:1 Bring Your Own Device (BYOD) program in Years 5 and 6. With Interactive Whiteboards, iPads, Netbook and MacBook computers in all learning spaces, teachers and their students are able to engage in learning experiences that are both innovative, creative and technologically relevant. Specialist programs are conducted in Performing Arts, Visual Arts, Physical Education and Mandarin (Chinese language program). Support programs for students include the Reading Recovery and Literacy Intervention / Enrichment Programs and the extension, ‘Programs for Individual Enrichment’ (PIE). Launched in 2012, students in Year 3-6 are also involved in the Stephanie Alexander Kitchen Garden program. As part of the Federal Government’s ‘Building the Education Revolution’ (BER) funding program, Auburn South Primary School received $3.2 million to build a state-of-the-art learning facility that comprises modern learning spaces, a Visual Art Room and a Library Resource Centre. Officially opened in May 2011, this outstanding facility continues to support 21st Century Learning that is enjoyed by all Auburn South students. In partnership with an active and supportive parent community, Local and Federal government, Auburn South Primary School continues to provide the very best opportunities for students as they seek to realise their dreams and aspirations.